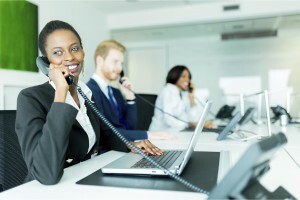 How important is a phone call for your business? Perhaps the best answer to that question is the amount of money you loose when your company misses a call. In 2014 BT Business published some research about this. The research was conducted amongst 505 IT decision makers and 1010 business telecoms end-users in the UK, all from companies between 20 and 249 employees. The respondents explained that customers would only try to call once or twice before taking their business elsewhere. On average, they estimated the cost of missing a single customer call at £1,200. The cost of being uncontactable by phone for a full 24 hours is substantially higher. Decision makers estimated the impact on average over £9,000. When using desktop telephones, getting a call to the right person in a hot-desking environment is even more difficult. The login procedure for desktop telephones is often cumbersome. In many occasions, people have to enter their email address and a password or pin-code via the telephone keypad. A procedure which is often – on purpose or accidently – forgotten, with the result that staff cannot be reached at all. They start to miss calls. At the cost of an average £1,200 per call, as explained. Exactly this is the reason that our Active Login Manager (ALM) software is not only used for security and efficiëncy purposes. It is also deployed by organizations to make sure their staff is reachable all the time. Our Single Sign-On solution for Cisco VoIP networks ensures that when employees are working at different desks during the week, they can use the phone on every desk as if it is theirs. Using our Active Login Manager, it is their phone with their number and their features as soon as they open their laptop. No hassle with usernames and pin codes. Eventually, it will cost you money if your employees are not available to speak to potential customers, partners or suppliers. With our ALM Single Sign On solution for Cisco VoIP networks, your staff is reachable. At any time and any place.